The compendium is one of the more elaborately decorated examples of the work of Ulrich Schniep. It includes both fine acid etching and enamelling. The instrument's component parts include a nocturnal and horary volvelle, an inclining sundial, a compass and compass rose, and a table of latitudes. 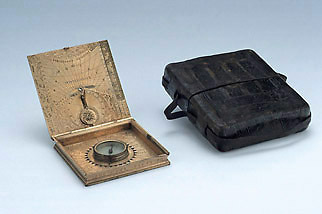 At a later date the compendium has been adapted by the addition of a latitude scale and folding strut, so that it can serve as a universal equinoctial sundial.